More than 8 out of 10 companies rate their digital marketing strategy successful to some extent at achieving their important goals, with 12 per cent rating it "Very successful." Only 37 percent of UK marketers have a documented content marketing strategy. 42% say they have an undocumented strategy while 18 per cent do not have one at all, and 3% were unsure. 88 per cent of marketers said they expected to produce more content in 2016 compared to 2015. Gaining a better understanding of their audience was one of the top five priorities for UK content marketers in 2016, with 46 per cent naming this as a goal. Looking out for upcoming trends but you could say "Digital marketing is a fast-paced, ever-evolving industry and in order to succeed, marketers must constantly look for the next big thing." The use of all paid methods to promote and distribute content increased over last year. The biggest increase was for promoted posts, which jumped from 34 per cent in 2015 to 64 per cent in 2016. 79 per cent of people in the UK say that a bad website negatively impacts their impression of a brand. If a post is longer than 1,500 words it receives an average of 68.1 per cent more tweets and 22.6 per cent more Facebook likes than a post under 1,500 words. 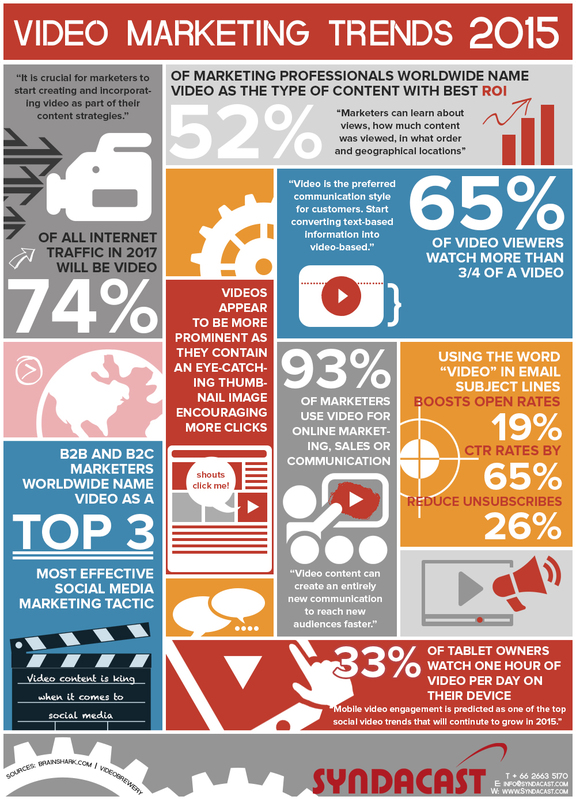 Experts predict that 74 per cent of all internet traffic in 2017 will be video. Colored visuals increase people's willingness to read a piece of content by 80 per cent. 91 per cent of marketers are planning for increased mobile budgets over the next 12 months. 52 per cent of B2B marketers said that measuring the ROI of content marketing programs was one of their top challenges. Analytics is the most popular data set marketers use to inform paid optimisation strategies, with 27 per cent using this tool. Twenty per cent look at conversion rates, while 17 per cent opt for A/B testing. SOURCES: State of content marketing 2016 survey report from Ascend2. 'Content marketing in the UK 2016 - benchmarks budgets and trends' report from the Content Marketing Institute. 'Content marketing in the UK 2016 - benchmark budgets and trends' report from the Content Marketing Institute. 'Content marketing in the UK 2016 - benchmarks budgets and trends' report from the Content Marketing Institute. Digital Dopamine 2015 global digital marketing report by Razorfish Quicksprout Syndacast Research commissioned by Xerox The State of The Industry: Mobile Marketing in EMEA by advertising insights brand Warc. B2B content marketing 2016 Benchmarks, budgets and trends - north america from the Content Marketing Institute and MarketingProfs. The state of lead capture in 2016 report from Formstack. Let's help you elevate your content creation.